In the Australian Bush, far from a power grid, Amateur Radio stations are usually run by solar power. This page describes my experience of converting an old, disused and rundown caravan, to a fully functional solar powered Ham Radio shack. The previous owners of our property had left this caravan standing on a slight hill in the middle of our acreage - a location which favours radio signals in all directions. It was beyond repairing to a standard which would see it mobile again, but would make an ideal, self contained Ham Radio shack. By the time I had decided to repair it, the van had been sitting, neglected and unused for at least ten years. 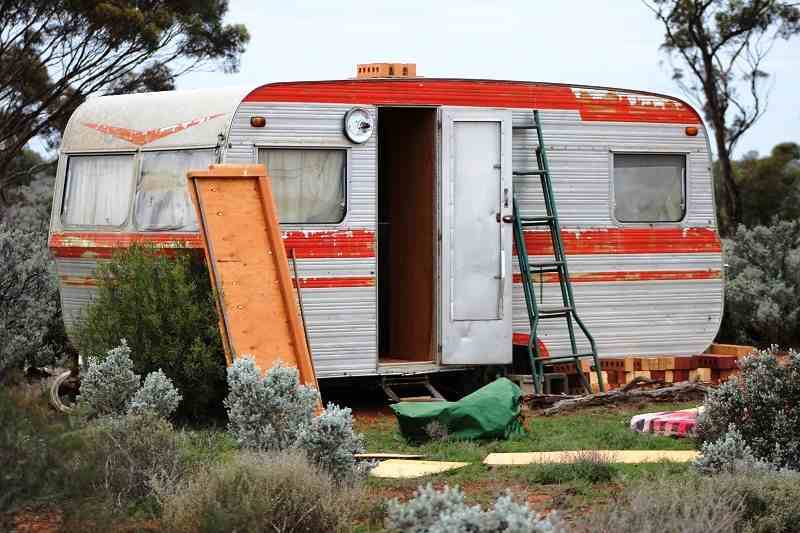 The following image shows the caravan before work was started to repair it. These days, solar panels are reasonably cheap, especially compared to prices of just a few years ago. I purchased two eighty watt, twelve volt, polycrystalline panels. The price, at the time of purchase, April 2014, was $240 Au each. This gives 160 watts to keep the battery in good shape. These panels were made in China and are supposed to last for at least twenty five years by which time the current output should be down by less than about twenty percent. The panels, wired in parallel, can deliver in the order of 20 volts and up to about 5 amps each, depending on sunlight. They are connected to a charge controller through heavy gauge wires. A galvanised steel frame was constructed to support the solar panels as shown. It was made from steel railings which were used in the construction of our colour bond garage. The frame, supporting the solar panels, was concreted into the ground and is very sturdy. Insulators are needed between the steel frame and aluminium panels to prevent corrosion. I used sections of black plastic irrigation hose with a hole drilled through the sides of it. The hose is compressed when the nuts are tightened. Stainless steel nuts, bolts and spring washers were used. Tilting the panels to about 45 degrees catches more of the winter sun. 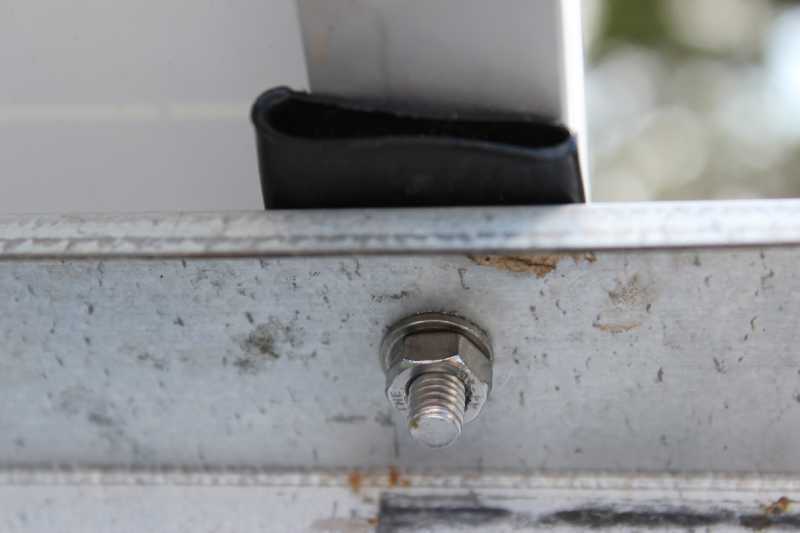 This image shows the compressed irrigation hose and stainless steel nut, bolt and spring washer. The controller or regulator is used to prevent overcharging of the battery and thereby extend battery life. It regulates the charging voltage to around 13.8 volts to 14.4 volts for ‘boost’ charging and about 13.5 volts for ‘float’ charging. These are approximate values. The controller cost $170 Au. 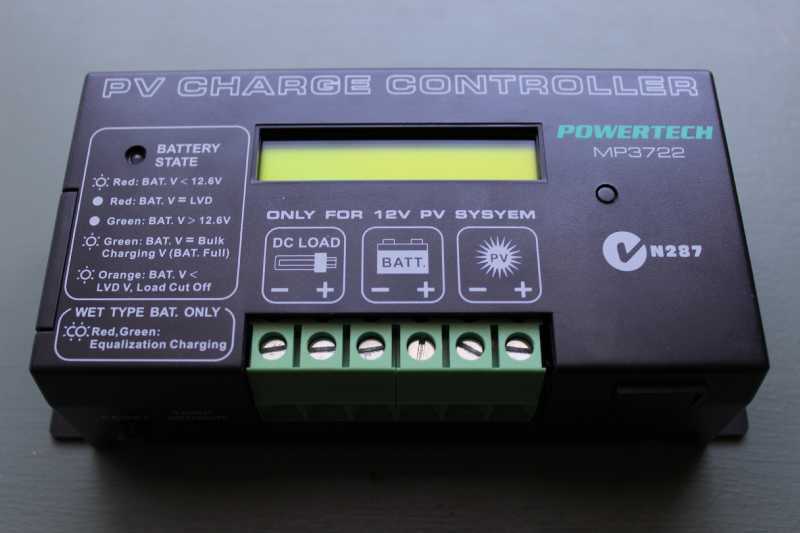 When there is a large current drain from the battery, the controller will allow maximum regulated current to flow into the battery from the solar panels. When it is fully charged, little current is sent to the battery. The controller here regulates the current and voltage fed to a deep cycle battery which is an AGM sealed acid type of 150 Amp Hour capacity. This size suits my needs at present but these batteries are not cheap. The cost was $700 Au, but once you have a solar system up and running, there are no ongoing power bills. Maintenance is not required on this particular battery which has an expected life span of ten years or more, depending on usage. I have another lead acid, deep cycle battery which has been in use for eight years. This image shows the caravan after repairs had been completed. Operating a Yaesu FT-450 on the HF bands here is good fun. The background noise level on the radio is very low because we are so far away from manmade noise. Surrounding windows mean that I have a good view of the countryside from the operating position. It is cosy in winter but too hot in summer, so most of my operating in the van is done during the cooler months. The sound of rain on the roof makes for very pleasant operating. It has been a good experience to repair this old and neglected caravan and to give it a new lease of life. Solar power is affordable, portable, clean, quiet and able to be used in all kinds of places such as here in the Australian Bush. you may like to view the other page. If so, click on 'SOLAR' below.